North of Donner Summit (elev. 7,989′), old volcanic flows and sediments bury most of the ancient bedrock of the Sierra Nevada crest. Beyond the North Fork of the Feather River, the Sierra Nevada yields to the southern Cascade Range. Rich in nutrients, the volcanic soils here are at the optimal elevation to receive sufficient rainfall to produce lush forests. Other plants include lupine, paintbrush, larkspur, columbine, gooseberry and manzanita. Animals include raccoon, marten, mink, badger, fox, bobcat and the ever-present deer and black bear. In the fall, skies are often filled with migrating birds on their journey south along the Pacific Flyway. The PCT traverses Lassen Volcanic National Park and crosses Highway 89 midway through the southern Cascade Range. Nearby is Mount Lassen at elevation 10,457 feet. North of the park, the PCT follows the extremely dry Hat Creek Rim toward majestic Mount Shasta, which dominates the skyline. The PCT turns west towards greener lands and drops to cross the Sacramento River (elev. 2,130′) at Interstate 5. 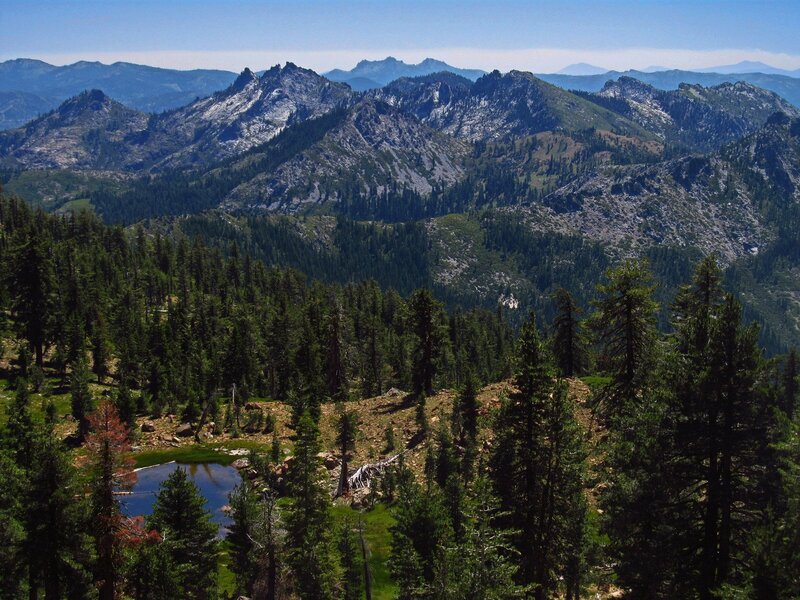 It then enters Castle Crags State Park and the Trinity Alps Wilderness. The trail reaches 7,600 feet in the mountains connecting the inland Cascade Range with the coastal ranges, winding north through the Marble Mountain Wilderness before descending to the Klamath River (elev. 1,370′). It climbs again to the crest of the Siskiyou Mountains and traverses east, entering Oregon near this section’s end at Interstate 5 near Siskiyou Summit (elev. 4,310′).